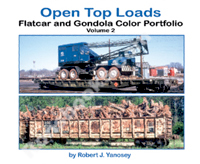 "Open Top Load" is the term given to the carriage of products or commodities on flatcars or gondolas. These products usually fit into two categories: 1) they are too large or bulky to fit into boxcars and/or 2) they are loose inexpensive material not suitable for a hopper car. These volumes feature large color photos of flatcars and gons with such loads, mostly recorded in the 1960s to the 1980s. The volumes are differentiated by the product or commodity carried, each which carry different AAR requirements for bracing, banding or other special instructions.